It's time for Secret Shoggoth! Where you would be willing to send a gift to – just your own country, own continent or anywhere. There's enough people involved that if you don't want to send something abroad, or can't afford it, that's fine. Please sign up by midnight GMT on Friday, 17th November, 2017. I will get details to you about your Secret Shoggoth by end of Friday, 25th November – though I'll aim for sooner. Gifts should be sent by end of Friday, 9th December so shop early if you're sending far away! If there are any problems please message me so I know you haven't lost your sanity by accidentally reading a dusty tome in the second-hand book shop. You must have been a registered user of the site on or before the 31st October, 2017. Please keep it clean and legal - let's say a PG or 15 rating, so no shipping guns to Britain or lock picks to Canada; or indiscrete shoggoth pics to anyone. Please mark your gift "Secret Shoggoth" - so your recipient knows where it's from! Five days to go for sign-up! If you are on the list above, feel free to post your 'Dear Secret Shoggoth' letter in this thread. Thank you for organizing this, Helen! First, any gift is appreciated, especially those made by hand. My usual suggestion - which has netted me many a fine read over the years - is for any books of folklore, legends, and/or ghost stories from wherever my Secret Shoggoth hails from. Alternatively, I do have an Amazon wishlist (not that you need to buy these from Amazon!) for Sentinel Hill Press' research library, many of which are very affordable (and a few that are definitely not!) and all have piqued my interest. Normally I'd say I have a full Call of Cthulhu collection, but I've not actually picked up any of the newer 7th Ed. releases (a few of which are within our price guidelines), ditto the print version of the latest Delta Green scenarios. Otherwise, I love a good black tea, dark chocolates, or anything you would like to share. Thanks! Seven hours left to sign-up! Iâ€™m easy to shop for but it can be difficult to mail things my way, so if youâ€™d rather bung me a .pdf or similar, feel free. Big fan of ghost stories, horror films, obscure RPGs. My tastes are Catholic - silent film, surreal stuff, odd graphic novels, all are grist to my dark Satanic mills. Right, after 2 hours work, all messages have been sent. If you are on the list above and don't have a message, please let me know ASAP. After a little cry I will sort it out! Please remember to name your Secret Shoggoth desires here (yes, I know that sounds a bit wrong). There are no guarantees you'll get what you want but if you don't ask, you definitely won't get. Hello Secret Shoggoth, wherever you are! My amazon wishlist might give you an idea of things I enjoy:P And ofc I am always open to something handcrafted if you're into that! I too put together an Amazon wishlist too to make things a tad easier for you as I have a slew of CoC materials already. The wishlist has some physical items if you're in my same country and if you are not some electronic items that avoids issues with customs. I'm not the easiest person to shop for since I am pretty much a collector (and a Keeper) so I have almost everything that is reasonable for Call of Cthulhu. 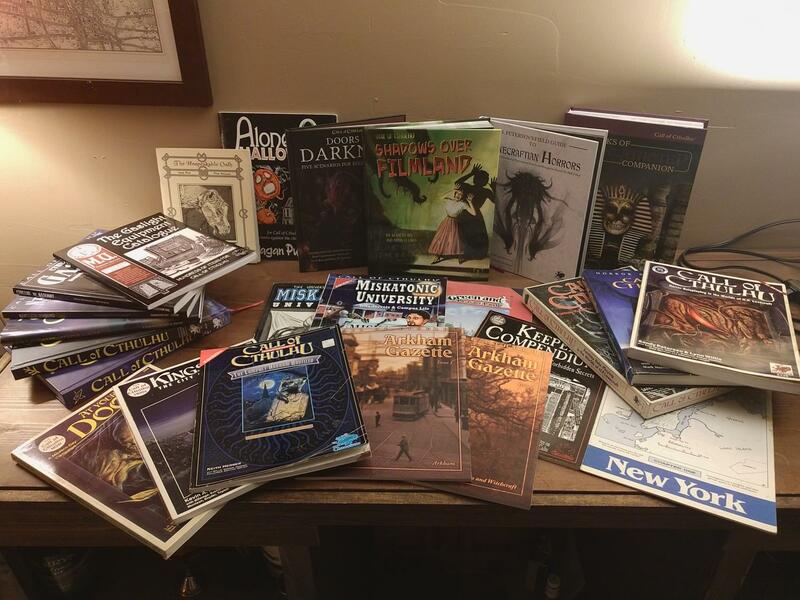 However, I'm open to history or popular culture books about the area you are from: it's always helpful to have some information about your local area for my Cthulhu games (and personal research). I'm also intrigued by homemade props or fleshed out scenarios with props. Those are all on my wishlist and should be within the amount (or close). That leads to your sign in page...so not much help for your SS. I await your gift with bated breath, waiting to hear the pitter-patter of pseudopods on my gambrel roof. I am a person of wide interests: old books, sourcebooks, handmade gifts, fiction - about the only things I could mention that I already have are Island of Ignorance and Shadows of Yog-Sothoth. I am looking to expand my game and scenario idea repertoire, so if you see any cool sourcebooks or magazines with neat scenarios in them, those would be very welcome. I am also open to books from any other systems than CoC, with the exception of D&D 4e. as an avid collector of all things CoC, I have nearly everything. The CoC things on my budget that are within my want list are all monograms (the phantom of wilson creek, halloween horror returns!, dead leaves fall, horror stories from the red room) or items that are harder to find and thus probably out of budget (Island of Ignorance: 3rd companion, Achtung Cthulhu: Three Kings, No Manâ€™s Land, Tales of the Caribbean, The Bermuda Triangle, the mysteries of mesoamerica, the resurrected III: out of the vault & The resurrected II: of keys and gates). Of course, handmade props or other crafty items of worship are more than welcome as well. As is anything HPLHS or books by mythos writers other than Lovecraft (Campbell, Bloch, ...) since I seem to have nothing but Lovecraft mythos tales in my library. Aaaaargh... I guess what I'm trying to say is: just forget about CoC books as I have nearly all of those and do what you want. I'm just here because I like to get something unexpected from someone a bit like-minded (might end up with a barbie-doll otherwise). Just be wary of sending sacrificial virgins. Postage may be a bit steep on those. Plus they tend to go lost in the mail. ps - reminder to self: don't send messages at 5am when you haven't had your fifth coffee yet. Greetings and well met yon Secret Shoggoth! The time and tides have splayed just long enough for the rift to allow for your endowment to reach far beyond the boundaries of the dimension, or at least here on the East Coast of the States. I am an avid collector of all things CoC and Delta Green; (I currently own CoC 7th ed, DG Agent's Guide and DG Handler's Guide). Any gift would be much welcomed! Some ideas mayhaps: customized dice and/or dice bag, props for CoC and DG scenarios, character miniatures (https://www.spectreminiatures.com/: too expensive, but along those lines), stand alone dice games (a la' Steve Jackson, et al), stand alone card games (Cthulhu Fluxx, CoC LCG, et al), Delta Green scenarios/ campaigns (Khali Ghati, Music From a Darkened Room, et al), any scenario ideas (Unspeakable Oath issues, etc), an amurleopard unisex barbarian knit beanie octopus (truly. https://www.amazon.com/dp/B06WVGHFVD/ref=twister_B0196L88L6?_encoding=UTF8&psc=1), a meet-and-greet with Stephen Alzis, an audience with the King in Taupe (the lesser known and mildly annoying half-brother to the King in Yellow), or copies of the Chartreuse Sign (it's the 1980's glow-in-the-dark version of the <gasp> Yellow Sign). Oh, and whirled peas. Hopes are passed that this will give you some greater idea into the wants and wishes of this lowly servitor. Happiest of holidays and well-wishes to all. Previously I have received include: A big bundle of YSDC output (including The Express Diaries), An Alan Moore lovecraft graphic novel, some lovely vintage newspapers and a wonderful wooden box with pencil and dice. All great presents, but anything you thing is cool and weird will be gratefully received. I've got almost all published material but anything else would be lovely. That being said, lovingly handcrafted, nightmare-inducing, evil-emanating objects are a great delight. I place this decision in your tentacles. Scary Solstice and all that jazz. I'm not a gamer (scandalous, I know), so I'm not interested in non-euclidean dice or CoC supplements, and I have all of HPL's published fiction, but I'll eagerly accept all other things Lovecraftian (or not, if you plan on throwing me a curve ball (no actual curve balls either, please)). P.S. - Please don't slide down the chimney because I honestly can't figure out where it leads. I request instead that you press your titan bulk against the door until it bursts open. So...I totally love weird stuff. Crocheted internal organs, sideshow paraphernalia, rogue-taxidermy (fake or ethical please), garage sale oddities, implausible specimen samples, rejects from the Museum of Bad Art - these are a few of my favorite things. I threw some together in an Amazon wish list, more to show range of taste instead of demanding these specific items. There are some game books in there too if you are in a pinch and need to make a snap selection. If you are non-US overseas, PDFs or finding a US-based vendor to keep shipping down is completely understandable. I am indeed a gamer, I enjoy horror and weird fiction, and I appreciate strange objects. I like oddball indie RPGs as well, if you break that way. What most interests me is something you specifically might want to share that gives you some personal shoggoth-y joy. If making things by hand is not your thing, maybe you have a favorite unsung Chaosium monograph? Discovered an obscure horror author whose stories haunt your nightmares? I like participating in the Secret Shoggoth circle because they start conversations. I would greatly appreciate some downloadable Audio stuff from HP Lovecraft Historical Society's Dark Adventure Radio series. I already have The Dunwich Horror, The Shadow Over Innsmouth , The Shadow Out of Time, and The Brotherhood of the Beast. A copy of The Dreams in the Witch House, or The Case of Charles Dexter Ward, or The Shadow Out of Time would be great. Just the downloadable MP3 file versions not the CD versions etc. Also keep an eye out for the Thanksgiving Black Friday discounts that may occur at that site during Thurs 23 - Mon 27th November. Regards, Talleryrand (yes I know it is misspelt). taking part in this christulhu tradition for the first time, I'm really looking forward to how it turns out! Besides Cthulhu related things, my other hobbies include baking (and eating said baked goods), so I like sweet stuff as well. I assume that we share similar interests. I can't think of anything specific. Just get something that you would rather keep than send to me! 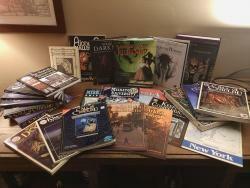 I have the 2 movies made by the HPLHS, and the Brotherhood of the Beast audio drama, plus what you see here. https://www.amazon.com/registry/wishlist/18NTPG3HNGD45/ref=cm_sw_r_cp_ep_ws_z2AfAbE4QGNYA if that would be helpful to you. I am fine with most anything though, especially books, recordings from HPLHS, or various trinkets and art. I also do love dice - the more the merrier! Happy Secret Shoggoth to everyone!